1. Preheat the oven to 200ºC, gas mark 6. Whisk together the honey, mustard, vinegar and olive oil. 2. Tip the onion slices onto a non-stick baking sheet and spoon over a tablespoon of the honey dressing. Stir to coat and bake for 5 minutes. 3. Stir together the bread, dill and remaining dressing and press on top of the salmon. Sit the salmon on the baking sheet alongside the onions and cook for a further 10–15 minutes until the salmon is golden brown and cooked through. 4. Meanwhile, cook the potatoes and green vegetables according to instructions then toss together with the baked onion slices. 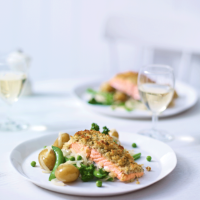 Divide between two plates and serve with the salmon fillets on top.